The love of music knows no bounds, whether piano, guitar, flute, or simply vocals. Celebrate the magic of music with this beautiful CHARM IT! Music Clef charm. With a glittery magenta music clef on a die-cut star in a rainbow of colors, this music charm makes a melodic statement on your charm bracelet. This music clef charm makes a great gift for the musician in your life or a wonderful reward for a lesson well done. With the simple snap of the clasp, you can add a touch of musical personality to your charm jewelry. Featuring a glittery gold star on the bass drum, your sweet drummer will love this 3-dimensional Drums charm. Celebrate the love of music with this beautiful CHARM IT! 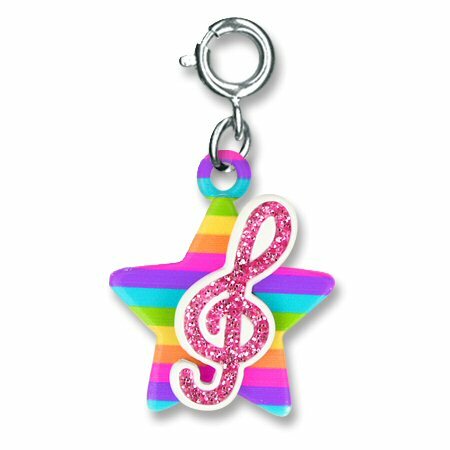 Glitter Music Note charm. Your CHARM IT! girl will love showing her Rock the House spirit with this fun Microphone charm. This fun beamed eighth notes fabric wall art is a wonderful addition to any music lover's room. This adorable eighth note fabric wall art is a wonderful addition to any child's room no matter their instrument. This fun treble clef fabric wall art is a wonderful addition to the room of any music fan. This fun quarter note fabric wall art is a wonderful addition to any music lover's room.